Quick fixes… the magic bullet… easy solutions… Every tennis player searches for that one thing that will change his or her game and reap immediate success. 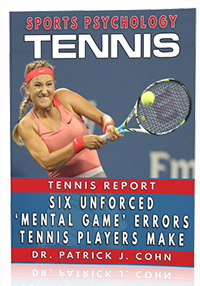 Many tennis players dabble in various “magical” methods to have an immediate impact on their game. These tennis players attend tennis clinics, buy high-tech racquets, take nutritional supplements and try various gimmicks that promise or “guarantee” success. Well, Band-Aids don’t cure broken bones and quick fixes don’t improve your tennis game. The problem with quick fixes is that, they may provide a temporary impact, their “newness” wears off and players slip back to their previous level of play. The reason quick fixes never work is because YOU and YOUR HABITS remain the same. Nothing of value comes easy. When the newness of the latest gimmick wears off, you will search for another temporary solution. Long-lasting change, improvement and success require hard work, dedication and discipline. Work (focused, diligent effort over time) is the formula for success. When you don’t see the immediate impact of your hard work, you may become frustrated or demoralized. Don’t fret! There is one supplement that can help you persist through tough times… mental toughness training. When tennis players improve their mental toughness, they are able to trust the process of training and know results will eventually come. If you supplement your physical training with mental toughness training, your performance gains will be long-lasting. No. 1 ranked Novak Djokovic has been a dominant force in the world of tennis for several years. Djokovic refuses to settle and be complacent, but continues to work hard and develop his game mentally and physically. 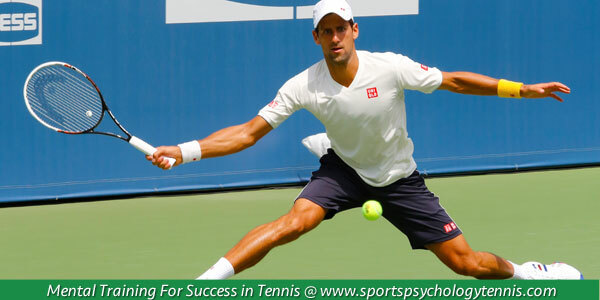 Djokovic’s court toughness and successful play are a direct result of his physical training and his dedication to developing a strong mental game. If you are willing to put in the time and effort like Djokovic and can be patient through the ups and downs, you will eventually see the fruits of your labor. A strong work ethic is a habit. If you want a better serve, you might set a goal of hitting 100 serves in practice. You know that you need to continue working on this process for it to become natural in practice. So if you hit a ball into the net during practice, you don’t just walk off the court. You make an adjustment and fire up the next serve. The same is true for developing a strong mental work ethic (which, by the way, will help you focus during your practice serves and keep your emotions in check). Pick a mental skill that you notice needs improvement. Dedicate a certain amount of time to improving that skill. Download my simple mental game test to see what you should improve. 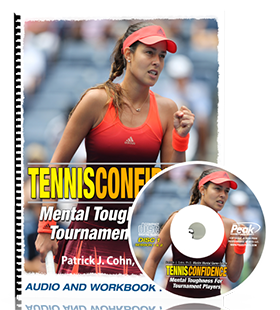 Many tennis players utilize training journals to keep themselves on track. Write out a daily plan and evaluate your progress in your training. Note how you respond when things go awry. Identify what you can do differently next time. Above all, be patient and keep working towards your goal!